UPDATE: The contest is now closed. Congratulations to Sophia (@chengsophia) on winning a $250 Visa gift card from Tourism Richmond and Keira-Anne! Thanks to all who entered. While growing up on Vancouver Island, escaping to “the big city” was always a huge deal – especially when those trips involved shopping for the kind of stuff we couldn’t find at home. Most communities up and down the Island offer day-trips to Richmond for shopping at a to-be-unnamed Swedish furniture store, but there is so, so much more to Richmond than just spatulas and sofas. Split into three distinct shopping districts, one could say that Richmond is a flawless trifecta of shopping. In the southern-most region is Steveston. Once a hub for canning salmon, it’s now home to the quaint and the curious with unique gifts that can’t be found elsewhere. Traveling north you’ll find Central Richmond, helmed by the sprawling Richmond Centre mall and co-captained by Lansdowne Centre mall. 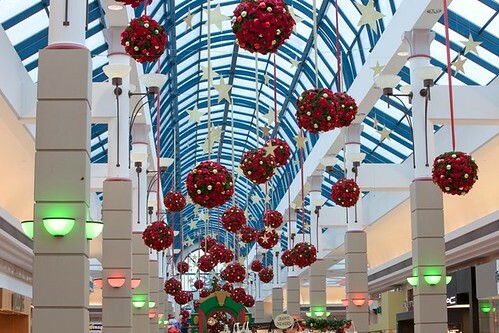 Accessible by the Canada Line and offering oodles of free parking, this area is home to no less than The Bay, Home Outfitters, Zellers, Old Navy and Winners. Soon Richmond Centre will also welcome the highly sought-after Sephora and Forever XXI. Finally, and perhaps what Richmond is most famous for, is Asia West. Dozens upon dozens of malls, stripmalls and blink-and-you’ll-miss-it shops, Asia West is an enticing blend of traditional Asian culture with contemporary style all found in one extremely exciting place. Make sure you check out Yaohan Centre and also Aberdeen Centre where you’ll find the popular Japanese Daiso store. I’ll draw one winner on Monday, December 13th. I still have one pair of alpine passes from Mount Washington Alpine Resort to give away. Click here for your chance to win until December 10th! I loooooove buying random foods, even if I have no idea what they are! Ha.. ! You MAY have been able to convince me otherwise. Steveston! I’ve only been there a couple of times but I’ve heard of the legendary seafood and little shops. Aberdeen Centre is a very unique mall – different types of stores and the variety of food found in the Food Court. Plus there’s always Daiso to explore! Steveston, primarily the hole-in-the-walls and restaurants. I haven’t yet visited the Steveston area. I have never been to Asia West so I would LOVE to go!!!! That is definitely somewhere I want to explore! Steveston. Only been a few times, mainly when I was a kid. The piers of Steveston! It’s always so beautiful all year round! Love the little boutiques in the Steveston Area… would spend it there! Steveston! I’d love to be able to see all the little stores on the pier. Central Richmond! Cute post! Learned something new about richmond today ahaha. Totally didn’t know it could be split up into 3 different sections! Cool! I’d love to explore Steveston! Since I’ve never been to the Richmond Centre Mall, I would check that out! Steveston for sure. I’ve never been! The Steveston area for sure. I’ve yet to explore there. Asia West. It’d be great to enjoy the food out there more often. I tend to stick around Steveston since I live in that area. Though I explore all of Richmond since its fun to find new eats. Steveston because I hardly venture there. I go there once in awhile in the summer and I’m curious to see what is happening there during winter. I miss the fish and chips there. That said, being a resident of Steveston myself I’m always attracted to the short walk into town to check out what’s new – there’s always something going on whether it’s big or small. I love the Steveston pier, it was a staple in my childhood before moving to Comox. I’d love to explore all the wonderful restaurants of the Asia West district! I love strolling around the shops in Steveston-that is my pick! I’d most be interested in exploring Asia West. I’ve been to Steveston briefly twice, but I’d love to go out there with my camera an early morning on a sub-zero day and take photos of the frost smoke coming off the ocean. Steveston for sure!!! I only got to briefly check it out when I was out that way for work but I would love to explore the little shops and restaurants! Definitely Steveston. Maybe the River Rock. i would love to check out steveston… fish and chips! I would like to explore Steveston! I like to bike ride around the dyke. Although all three sites in Richmond have some different and unique offerings, I think Asia West would be the most exotic to explore, made all the more exciting by just getting off Vancouver Island for a little shopping adventure! I would love to check out the Edgar Allan Poe Museum, he’s one of my favorite writers! Steveston for sure, it’s Richmond’s little hidden gem. The Mount Washington Resort sounds and looks Awesome! I wanna win! I’d like to explore around Finn Slough. Raised most of life in Richmond – gotta say the trails along the dykes are pretty cool for wildlife. My Mom used to take me to Steveston all the time when I was a kid but I haven’t been in years. I’d love to check it out to see how it’s changed. Steveston definitely as there are some quaint restaurants and little shops by the water. I have been itching to check out the Richmond Daiso ever since discovering and falling in love with the Daiso stores in Japan, so I guess the area I would want to check out would be Asia West! I went to Aberdeen Center a couple of years ago and fell in love with this little tea shop they have there. I have been meaning to go back because they had a fantastic selection of tea pots. There is also a Japaneses Dollar Store that I could live in! With all the talk of Asia West, I think I’d have to check it out. Thanks! I would love to visit aisa west because I would love to explore the culture and attractions there. I would also love to go to the grocery hall of fame. I’d love to attend the Steveston Salmon Festival held every year on Canada Day. I wouldn’t know which area to check out so I would leave it up to my wife as she used to have family in the Richmond area. Would be nice to check anything out and I’d read some of the suggestions here as well!! I live just outside of Richmond and haven’t visted the seaside boutiques of Steveston, That would be the place I am most interested in exploring in Richmond, I didn’t even knoe that the boutiques exsisted! I would love to check out the seaside boutiques of Steveston. I haven’t been there since I was little with my dad. Definitely Steveston. I love it there!!! I’d love to explore the Richmond Centre mall!!! I would like to go shopping in the Golden Village. I’d love to shop in Central Richmond! Hmm. I’m going to pick all three because I’ve never been to any of those places and I’d love to explore them. Living in Vancouver for three years has clearly not lended me enough time to experience Richmond. ha. It’s time now. I would like to visit Steveston area, because that is where all the seafood are. I would love to explore the local markets that are on for Christmas in Steveston. Also, I haven’t been there for a few years and I’ve heard of some neat artisans and foodie places that are tucked away in little corners I’d love to support. The last time I was in Steveston, I met the loveliest woman in a shop and she sold me the perfect present for my best friend and entertained me with great banter while wrapping it for me. I love that aspects of Steveston still have that local feel! I would love to explore more of Steveston, I adore all of the little shops in the village of Steveston and there is also a great tea place to check out. Normally when I go there, I am just picking up some fish or going to meet some friends at a restaurant. If I had an afternoon to explore Steveston, I would spend some time in the shops, they would be a wonderful place to buy unique gifts (Christmas gifts too!) from places that are not mainstream chain stores. This would be an absolutely wonderful prize to win to spend in Steveston, both to support the local shops, enjoy an afternoon and be able to get some presents for loved ones. I just moved to Richmond and have not had the chance to really get to know my new area! Growing up in Vancouver, I never spent much time in Richmond but I love living here. Steveston is one of my favourite places to visit, we actually went there recently to support local charities for a Christmas event and went on a horse-drawn carriage ride around Steveston. That gave me the chance to see many stores I never noticed when I normally drive through. I would love to support the local businesses and get some great Christmas gifts from there. 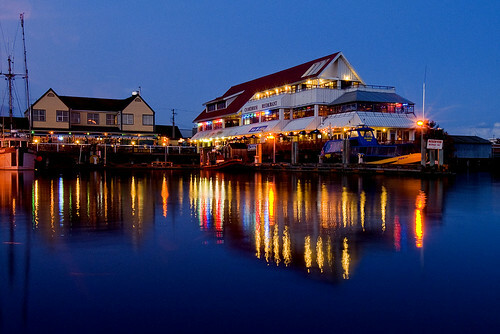 I’d love to learn more about Steveston, see all the shops, visit all the restaurants and walk along the pier. I would check out the River Rock. I always ride my motorcycle to Steveston in the summer and LOVE it but have not yet checked out the casino. Would be a nice dinner date with the wife! I could use the $250 to afford a babysitter for the night…when did they start making as much as a lawyer? I would love to explore Steveston more! I’ve only been there once and I didn’t have time to see everything. I love Richmond centre. I worked there as a teenager and always loved the shopping. Would love to visit there again. I have yet to go to the Daiso store. That would be my first stop…. I have not been to Steveston in ages. I should check it out soon. I’d love to explore Steveston and visit the little shops for truly authentic gifts. Great prize! I had no idea Richmond had so much to offer. Asia West and Steveston are tied, and I would like to check them both out. I haven’t been to Richmond Center in ages. Would love to check it out. Steveston! I actually live there, but I’m so busy I never get a chance to take time and explore it. I love like to explore Steveston just because last time i went there too look for a friend i got lost. I love the cute little stores in Steveston… so I would love to go shopping there! Steveston! Heard they have great seafood! I’d love to explore Aberdeen Centre! Always thought it was a beautiful mall, and never got a chance to shop in it. It’s been over five years since I visited the Steveston area including the fish market there so I’d have a great time trying all their delightful foods again! I would love to explore Steveston just because Last time i went there too look for my friend and got lost. I retweeted. I wonder if there are any really good bead shops in Richmond? Which ever section sells vegan-leather boots that will fit my small, carney feet! i’d spend it in steveston. I love walking around Steveston in the summer. I’d love to explore Steveston. It’s so close and I have never been there! Never been to Steveston. Have spent a lot of time at the airport shops and at Ikea. Great place, that Richmond.